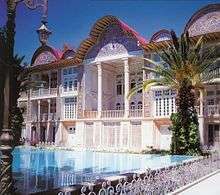 Iranian architecture or Persian architecture (Persian:معماری ایرانی) is the architecture of Iran and parts of the rest of West Asia, the Caucasus and Central Asia. Its history dates back to at least 5,000 BCE with characteristic examples distributed over a vast area from Turkey and Iraq to Uzbekistan and Tajikistan, and from the Caucasus to Zanzibar. Persian buildings vary from peasant huts to tea houses and garden, pavilions to "some of the most majestic structures the world has ever seen". In addition to historic gates, palaces, and mosques, the rapid growth of cities such as the capital, Tehran (Architecture of Tehran) has brought about a wave of demolition and new construction. The Eram Garden in Shiraz is an 18th-century building and a legacy of the Zand Dynasty. 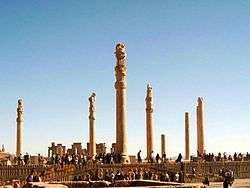 Persian-style column, as seen in Persepolis. 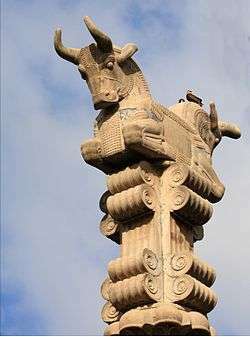 The columned porch, or talar, seen in the rock-cut tombs near Persepolis, reappear in Sassanid temples, and in late Islamic times it was used as the portico of a palace or mosque, and adapted even to the architecture of roadside tea-houses. 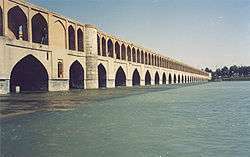 Similarly, the gonbad on four arches, so characteristic of Sassanid times, is a still to be found in many cemeteries and Imamzadehs across Iran today. The notion of earthly towers reaching up toward the sky to mingle with the divine towers of heaven lasted into the 19th century, while the interior court and pool, the angled entrance and extensive decoration are ancient, but still common, features of Iranian architecture. 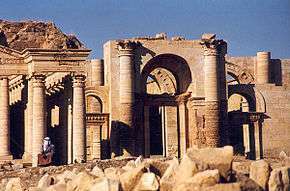 Hatra in Iraq. In the 3rd to 1st century BCE, during the Parthian Empire, Hatra was a religious and trading center. 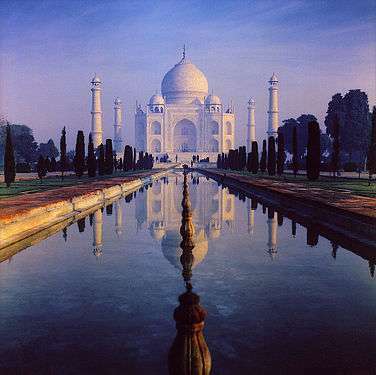 Today it is a World heritage site, protected by UNESCO. The ruins of Persepolis, Ctesiphon, Jiroft, Sialk, Pasargadae, Firouzabad, and Arg-é Bam give us a distant glimpse of what contributions Persians made to the art of building. The imposing Sassanid castle built at Derbent, Dagestan (now a part of Russia) is one of the most extant and living examples of splendid Sassanid Iranian architecture. It is since 2003 inscribed on Russia's UNESCO World Heritage list. 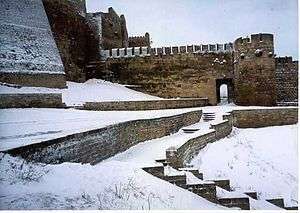 Sassanid fortress in Derbent, North Caucasus. The fall of the Sassanian dynasty by the invading Muslim Arabs led to the adaptation of Persian architectural forms for Islamic religious buildings in Iran. 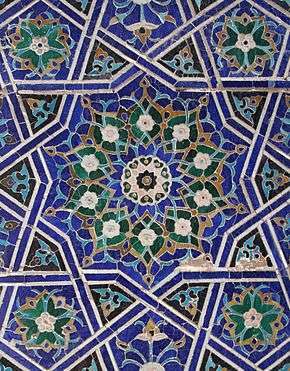 Arts such as calligraphy, stucco work, mirror work and mosaics became closely tied with the architecture of mosques in Persia (Iran). 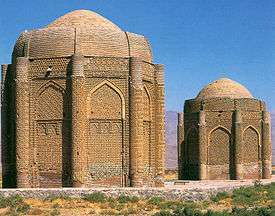 An example is the round-domed rooftops which originate in the Parthian (Ashkanid) dynasty of Iran. Another aspect of this architecture was the harmony with the people, their environment and beliefs that it represented. At the same time no strict rules were applied to govern this form of Islamic architecture. 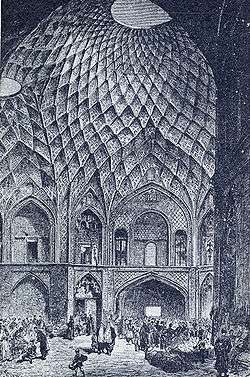 The great mosques of Khorasan, Isfahan and Tabriz each used local geometry, local materials and local building methods to express, each in their own way, the order, harmony and unity of Islamic architecture. When the major monuments of Islamic Persian architecture are examined, they reveal complex geometrical relationships, a studied hierarchy of form and ornament and great depths of symbolic meaning. 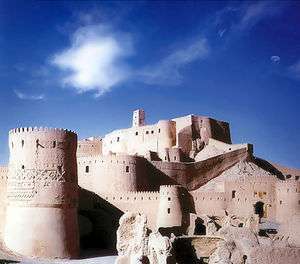 The ancient Palace of Ardashir, constructed in 224 during the Sassanid Dynasty. The building has three large domes, among the oldest examples of such large-scale domes in the World. Architecture of Persian Gardens. Khalvat-i Karim-khani, in the gardens of the Golestan Palace. 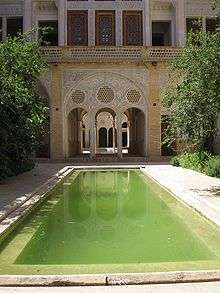 Architecture of houses: The 18th century Abbasian House, Kashan. Places of worship: mosques and cathedrals. 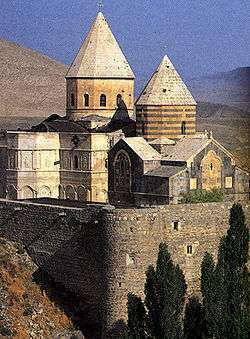 Thaddeus Monastery, 68CE, West Azarbaijan province. Contemporary architecture in Iran begins with the advent of the first Pahlavi period in the early 1920s. Some designers, such as Andre Godard, created works such as the National Museum of Iran that were reminiscent of Iran's historical architectural heritage. Others made an effort to merge the traditional elements with modern designs in their works. The Tehran University main campus is one such example. Others, such as Heydar Ghiai and Houshang Seyhoun, have tried to create completely original works, independent of prior influences. Borj-e Milad (or Milad Tower) is the tallest tower in Iran and is the fourth tallest tower in the world. Iran Senate House Traditional Persian mythology such as the chains of justice of Nowshiravan and essences of Iranian architecture have been incorporated by Heydar Ghiai to create a new modern Iranian architecture. Tehran's Museum of Contemporary Arts designed by Kamran Diba is based on traditional Iranian elements such as Badgirs, and yet has a spiraling interior reminiscent of Frank Lloyd Wright's Guggenheim. Major construction projects are underway all around Iran. Iran is developing Isfahan City Center, which is the largest mall in Iran and the largest mall with a museum in the world[ List ]. It includes a hotel, indoor amusement park, and food court, among other amenities. The Flower of the East Development Project is another grand project on Kish Island in the Persian Gulf. The project, includes one '7-star' and two '5-star' hotels, three residential areas, villas and apartment complexes, coffee shops, luxury showrooms and stores, sports facilities and a marina. 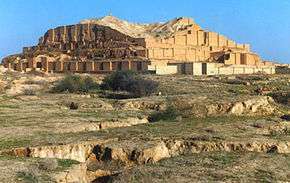 Ziggurats such as the UNESCO designated World Heritage Site of Chogha Zanbil, which relieved the flat monotony of the southern Khuzestan plane, were but "ritual imitations of the familiar sacred mountains which ring the Iranian plateau". Click here for animation of Iranian architecture. ↑ "Discovery of brick tablet in Jiroft proves 3rd millennium BC civilization". 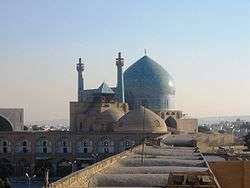 ↑ "Imam's Mosque". World-heritage-tour.org. 2005-03-12. Retrieved 2011-03-27.